Ideal for family holidays, weekend trips, the sports enthusiasts with too much gear for the boot/roof rack or simply the small business with goods to move. You’ll find the BV64e an ideal way to keep all your belongings safe, dry and away from prying eyes. When not in use it can be safely parked up in your garage, being low enough to fit into most garages and light enough to manouvre easily. It is great for camping or enjoying outdoor activities such as cycling, canoeing, fishing or skiing, especially where bulky equipment is needed – it can even be used to carry a junior kart. Unladen weight is based on model fitted with roller shutter door. 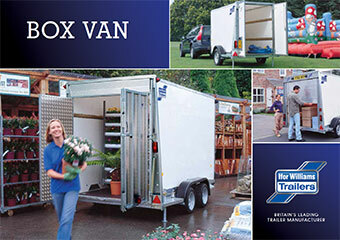 For more detailed dimensions and volumes, download the box van brochure. The curved front, aerodynamic mud wings and roof all contribute to greatly reduced wind resistance. The super strong, low maintenance rubber torsion suspension system features a galvanized axle beam for years of trouble free service. Large lamps with integral reflective triangle, feature clear bright functions so those all important lane-change indicators are not missed on the motorway. For use when trailer is uncoupled offering additional stability when loading.